While the hum-drum buzz of everyday life takes place all around us, most busy people are ignorant of what lies a few tens of meters from the Town’s major highways, where three “off road” thoroughfares (The Minuteman Commuter Bikeway, the Narrow Gauge Rail Trail, and the Minuteman Extension or Reformatory Line) come together at Depot Park, making Bedford a cyclist’s Mecca. 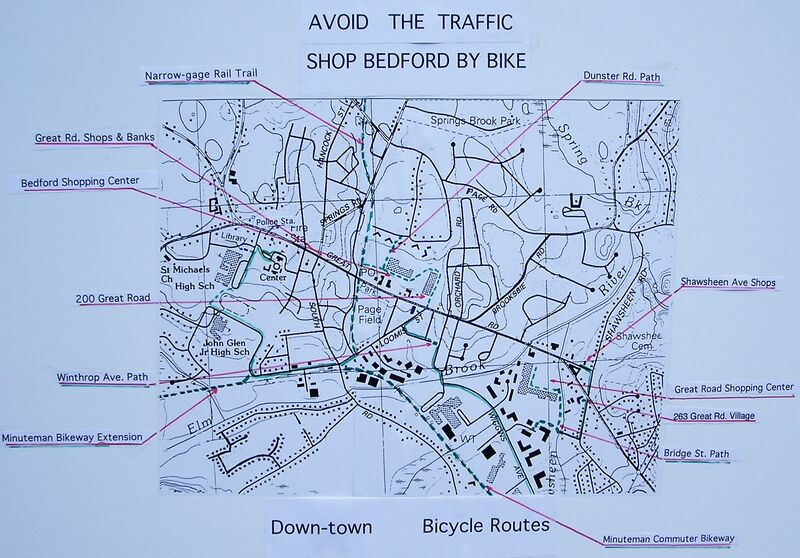 Paralleling the Town’s most heavily used travel corridors, these greenways offer cyclists safe, relaxing, traffic-free routes to Bedford Center from the east, north, and west. To explore them in their current state and showcase their potential as alternatives to riding the Great Road, North and Springs Roads, and Route 62 west, the Bicycle Advisory Committee has mapped some short “Tours” starting from Depot Park and, between them, covering the entirety of all three bike paths in a grand loop around town. Furthermore, in keeping with the celebration of Bedford’s 275 years of incorporation, the loops are designed to pass by a number of historic sites and through many of the Town’s thirty-plus conservation areas. Anyone (including minors accompanied by a parent or guardian) sufficiently fit to cycle a dozen miles in two hours over a variety of surfaces, some unimproved, is eligible to participate. The Tours cater both in length and difficulty to casual riders operating mountain and/or hybrid bicycles comfortable on both paved and “civilized” off-road surfaces; employing the latter as “short cuts” between relatively traffic-free neighborhood ways avoids high-speed, high-volume roads. Because of this, the routes are not suitable for “tag alongs”, trailers, or kiddy seats. In addition to bringing a bike in good working order, all participants MUST wear a properly fitting Snell or ANSI approved helmet and carry some form of identification. A spare tube and a means of inflating it are useful adjuncts; ride leaders will carry tubes and pumps suitable for their own bikes and these may serve in a pinch, but there’s no guarantee. Leaders will also carry a few tools just in case something heavier than a flat happens and a quick improvisation is needed to enable a rider to limp home. Participants with medical conditions (asthma, anaphylactic reactions, poison ivy sensitivity, etc.) are expected to bring any medicines they need with them; leaders are not authorized to dispense drugs and won’t carry them. Guided Tours are occasionally organized by the BBAC, and will be posted on the calendar page of this website. Start at Bedford's boat landing off Carlisle Road. Left onto Skelton Rd. to River Road. Left on River Road which becomes Monument Street in Concord. Follow Monument Street, cross the Concord River and stop at the Old North Bridge. you may be able to walk your bikes across the bridge up to the Buttrick House and out to Liberty Street. If not, go back to Monument Street, go left, back across the river to Liberty Street. In either case go left on Liberty Street to Lowell Road. Left (south) on Lowell Road, cross the river again, and go immediately right into the parking area to view the confluence of the Sudbury and Assabet Rivers into the Concord River. Continue south on Lowell Road (go right out of the parking area). Shortly turn left onto the old railroad right of way that goes east to Monument Street. Cross Monument St. continuing the old railroad right of way. Follow the rail bed to the driveway of Great Meadows National Wildlife Refuge. If you turn left into the GMNWR, you will find a fun viewing platform. Continue on the rail bed to Concord Road in Bedford. Cross Concord Road onto the Minuteman West trail. Straight across Concord Road onto Ten Acre Drive. Ten Acre Drive to Norma Rd. Left on Norma Rd. to Glen Terrace. Right on Glen Terrace to Glen Ridge Drive. Right on Glen Ridge Drive to Notre Dame Rd. Right on Notre Dame Rd. to Hillcrest Rd. Left on Hillcrest to Davis Road. Right on Davis Road to William St.
Left on William St. to Jeffrey Circle. Right on Jeffrey Circle, pass Madel Lane, to the end. There is a hole in the hedge, cross a field. Approaching the rear of the houses on Winterberry Lane, go left onto the right of way between their rear property line and the Great Meadows NWR property and out onto Winterberry Ln. Left on Carlisle Road and return to the boat landing. MSN TerraServer aerial view of Bedford - click on photo to zoom in!